Ontario's Miles MacMillan has put together a well-crafted, well-played disc of cosmitronics that definitely has its antecedents in early Jean-Michel Jarre and 80s-era Tangerine Dream (White Eagle and Hyperborea, for instance). Lots of pulsing sequencers, electronic percussion, and analog-styled synth sweeps rocket through the interstellar void on pieces like "In the Wake of the Comet" and "Irreversible Fall into an Abyss of Obscurity." The arrangements are crisp and sparkling and generally avoid the most common pitfalls-repetitiveness and glibness-of purely electronic music. 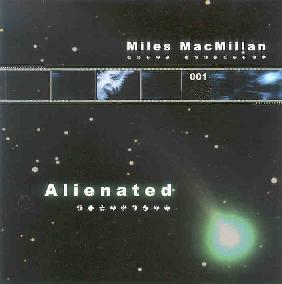 And though MacMillan sometimes veers dangerously close to the "Hearts of Space" new age yawn and snore (particularly on "Lullaby for the Aliens"), aficionados of sci-fi inspired electronic music will appreciate the consistently high level of musicianship displayed on Alienated, as well as the sleek production job. No new ground is broken on Alienated-and nor does there have to be-so don't expect any sort of cosmic apocalypse to stun your central nervous system on your visit to the interplanetary realms MacMillan will navigate you through. However, fans of Jarre, Schulze, Tangerine Dream, and Michael Garrison will definitely want to check this disc out. For more information you can visit the Miles MacMillan web site at: http://www.milesmacmillan.com. Contact via snail mail c/o Miles Music; 200 Massey Dr; North Bay, Ontario; P1A 4G8; Canada.